The WFLBC BBQ Challenge has officially begun, first stop Squamish!! Squamish? Yes, Squamish, I recently spent a week in Whistler for work and did a lot of eating all around town and I now have a stockpile of restaurants to reviews for this blog and for the Vancouver Observer. On the way home I wanted to stop at a BBQ place I had heard about via Twitter called The Campfire Grill – Smokin’ BBQ. I had no idea what I was in for. I don’t know what I was expecting but this certainly was not it, and what a nice surprise! 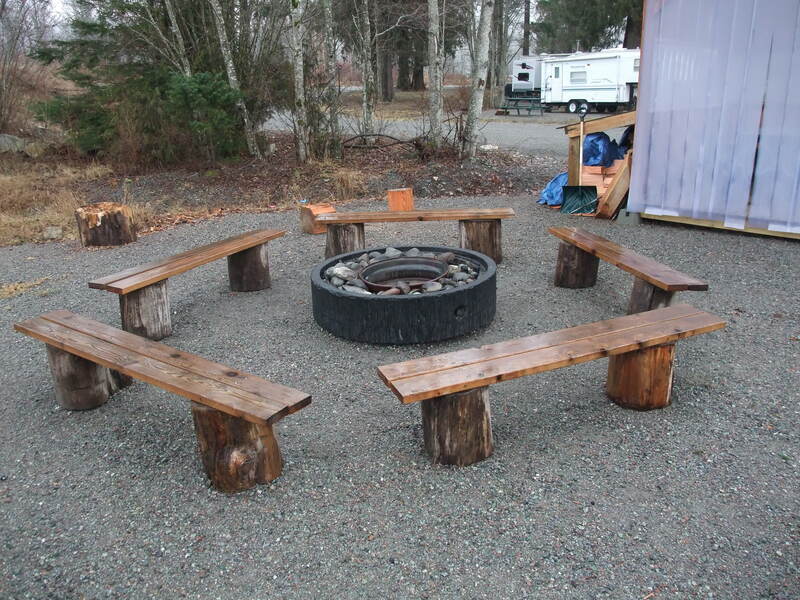 Located at the Eagle Vista Resort and Campground at 1940 Centennial Way in Squamish it’s about as inconspicuous as it gets, it’s actually in the campground! Thinking that the GPS had led me astray I finally noticed the trailer and assorted small structures around it and headed over to say hello. Chef Mike McCrea and his wife Inger, aka the boss, greeted me with a smile and gave me a tour of the truly unique and pretty awesome setup they have. You really have to see it to appreciate it but it is very cool with gas heaters in a outbuilding filled with picnic tables, a fire pit surrounded by benches and an ordering area with another heater and a nicely done menu board along with very professional brochures and business cards. Mike was kind enough to make me up a one man sample plate for the purposes of my BBQ Challenge that consisted of pulled pork, pork ribs, beef blade, chicken, and a stuffed burger. The pork was juicy and well seasoned, the beef was fantastic and savory and the chicken, dark meat by request, was cooked perfectly with the skin on. The ribs, which I ate before I remembered to take a picture, had a nice smoky crust and were tender and juicy as well. 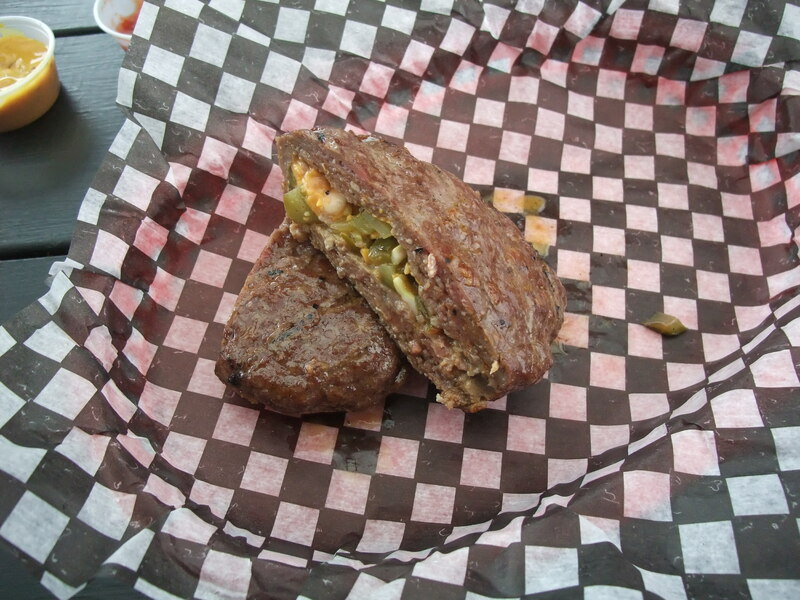 The stuffed burger which is only available on Friday is made with locally sourced organic beef stuffed with pickles, banana peppers, cheddar and Monterey jack cheese. Great texture and flavor from the beef and the stuffing was awesome, plus it was cooked a nice medium, perfect. Over all this is some of the best food, let alone BBQ, I have ever eaten. 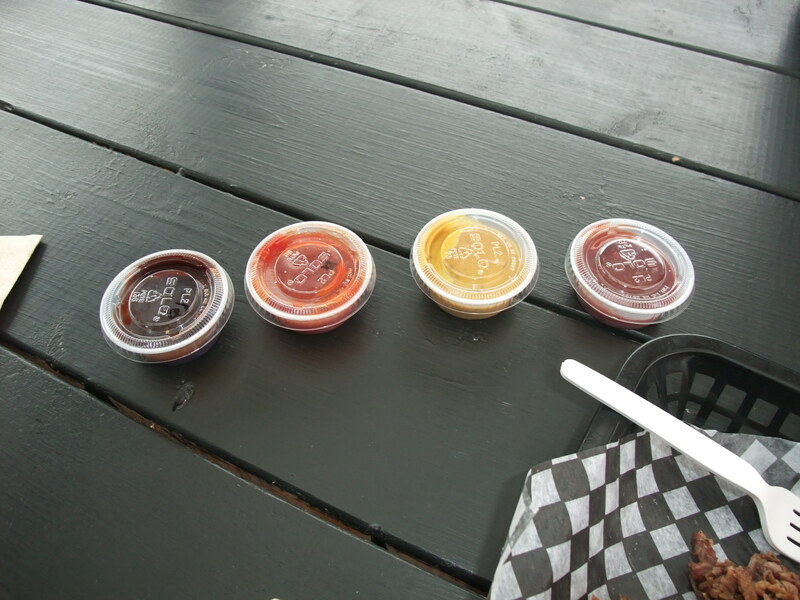 Then there are the sauces, oh my god the sauces! All made by Chef Mike they are a foursome of mouth watering accouterments to go with the fantastic meat. There is a trio of BBQ sauces, bourbon, apricot and chipotle and a honey mustard sauce. The Honey mustard goes great with everything but pairs best with the chicken. The apricot paired best with the pulled pork and the bourbon went great with the ribs. The chipotle was my favorite and went great with everything, especially the beef. I also tried Chef Mike’s home made pecan tarts cooked on the grill and they were fantastic! So BBQ challenge 2011 has it’s first official entry and if this food is a sign of things to come I’m in for a great ride! If you’re passing through or visiting Squamish, or if you just want to go somewhere incredibly cool to eat you need to make a stop here. Based on my BBQ experience this place may be hard to beat. I may have to rearrange my categories a little but I think the WFLBC BBQ Challenge is going to be a big hit!! Twitter, the best friends you have never met. My daughter Hayley’s first birthday is quickly approaching and in honour of this special day we are having a party! Not just any party though, we are foregoing the usual gifts like toys and clothes and instead holding a fund raiser for Variety, The Children’s Charity. Most of you who read this blog on a regular basis already know Hayley’s story, if you don’t you can read about it here. We think that giving back is a gift that will benefit not only Hayley, but many other families and kids who need help when faced with similar circumstances. Having a child who is in need of ongoing or emergency medical care is a frightening and helpless time in a family’s life and without the support of Variety many children and their families would face a much darker future. The party will have cake and balloons and all of the things you would expect at a kids party, minus the presents, but it will also have places to make donations, info on how to donate online and a silent auction. The silent auction was Lyndsey’s idea and I was a little confused at first as to where the items for this auction would come from. We had a friend and fellow tweeter, Heather Vince, suggest that I use this blog and my Twitter presence to drum up some items from some local businesses. The amazing outpouring of generosity that followed was and still is overwhelming to say the least. Lyndsey and her sister have managed to round up auction items from Dead Frog Brewery, Domaine de Chamberton Winery in Langley and Shanny Bows. I have received items and or verbal confirmation of items or services from The Roaming Dragon, Tinhorn Creek Winery in Oliver BC, Paul Stirfry in Yaletown, Barcelona Nightclub and a few others that I am patiently waiting to confirm. The items I have received have all come through my own Social Network on Twitter and through this blog. These are people that I have never met, except for Jason at Gourmet Syndicate who I met once. Truly touching that they would see fit to help with this small fundraiser, I can’t thank them enough. There will also be a few awesome gift baskets put together by various friends and family along with a 50/50 draw. I will keep you posted on how much we raise and any other auction items that come our way, we are open to any items as all of the proceeds are going to Variety. If you would like to send us some love or even attend the party shoot me an email and I’ll see what I can do. I really can’t thank those who have helped us enough other than to say that I am forever indebted to all of you and I can’t wait to return the favour!! I don’t bake, I have never made a cake, muffins, bread, cupcakes or anything of the sort and I didn’t think I ever would. Baking holds no magic for me, at least not in the way other forms of cooking do. Cooking is an artistic process for me where I create a dish with constant attention from start to finish. The end result is a direct reflection of the time, effort and creativity I have put in to the dish. 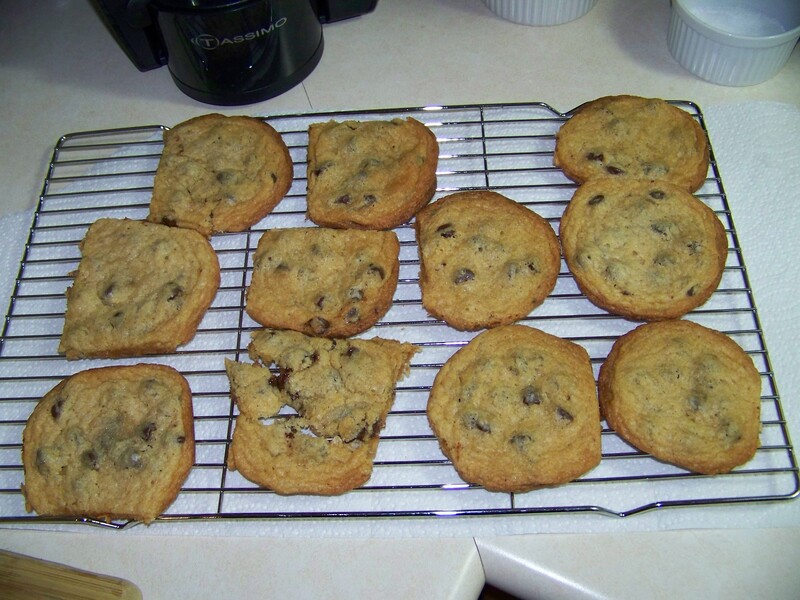 Baking involves the mixing of ingredients and then putting them in an oven to let them magically transform in to the end product with little or no intervention during the cooking process. I didn’t see the appeal of it until I found a recipe that I couldn’t resist making. Popovers are an American variation of Yorkshire Pudding, believed to have originated in the mid to late 1800’s. 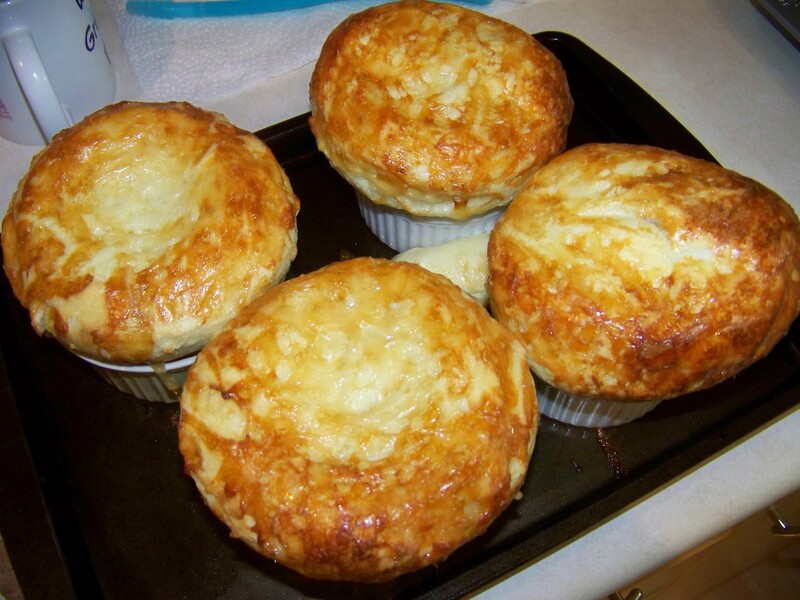 The term Popover comes from the way the batter “pops” over the sides of the muffin tin while they are baking. The recipe I used is from BLT Steak, a steak house chain based around the vision of executive chef Laurent Touronde and his take on classic American dishes. I have eaten at BLT Burger in Las Vegas and it was fantastic. The recipe is available on Epicurious.com and is wonderfully simple yet scientifically complicated. I’m not going to go into a step by step guide of how to make Popovers, I’ll leave it up to you to read the recipe but I will say that I am amazed that I was able to make this wonderful dish with my limited baking knowledge. There is some complicated science going on in this dish that involves preheated muffin tins, warm milk and no leavening agents. The dough rises through a chemical reaction between the warm milk, warm muffin tin and other ingredients. Needless to say they are delicious, with a crispy outer crust accented with Gruyère cheese and soft melt in your mouth insides. Add a little butter and let it melt into the soft dough and you are left with something more than the simple ingredients would ever lead you to believe were possible. Look up the recipe and give it whirl. You never know, this baking thing might just catch on. 1. Ribs. 2. Pulled Pork. 3. Beef. 4. Chicken. 5. Specialty Item. 6. Tap list. 7.Best overall. Category 6 will depend on the restaurant being licensed. The overall winner does not necessarily have to have every category but it certainly won’t hurt. This challenge will take quite a while to complete given the amount of food and categories that are involved and I may need an assistant and Mr. Kevin Addy has graciously volunteered his services. So what do I need from you? I’m glad you asked, if you know of a BBQ joint anywhere from Squamish to Hope I want to know about it. Even places that aren’t 100 percent BBQ but have a BBQ item or 2 on their menu will be considered, for example Big Ridge Brewing Company in Surrey will be in the pulled pork category even though that’s the only BBQ they serve. The final results will be announced in one of my weekly articles and will be a mouth watering, meat lovers paradise. Start sending me those BBQ hot spots by leaving a comment at the bottom of this post or by email to whatsforlunchbc@rocketmail.com (just copy and paste the address). As always thanks for reading and don’t forget to check out my new gig at The Vancouver Observer as a real, honest to goodness restaurant critic/writer of random awesomeness. Qwest Field, Seahawks Vs. Rams. 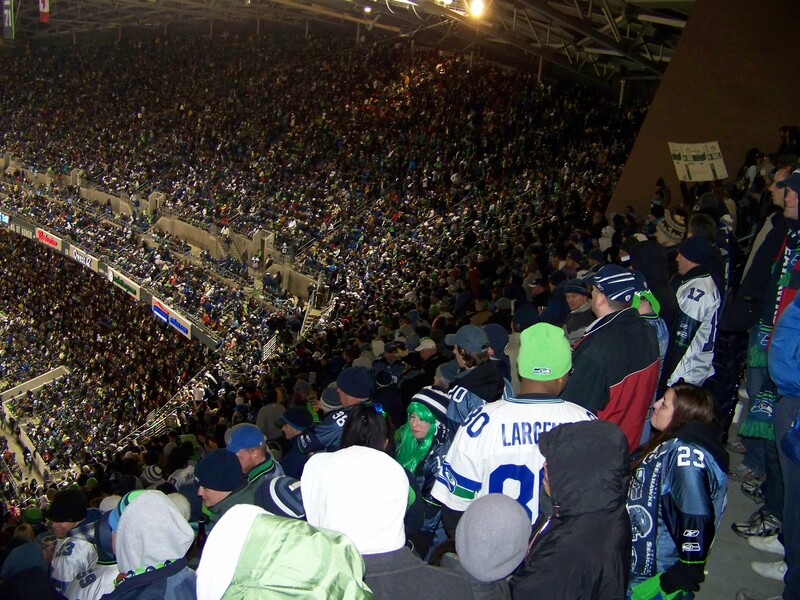 My original intention was to write an article highlighting the differences between the food available at Seattle sporting events such as Mariners and Seahawks games versus the food available at Vancouver sporting events like Canucks or Lions games. It was going to be my first article for The Vancouver Observer, a local on line source for all things Vancouver. While doing a little research for the piece I realized that I wasn’t qualified to write such an article as I haven’t been to a Canucks Game in over 2 years! I checked on the website for Roger Arena and it seems that the selection has improved quite a bit since my last visit. So much for my first VO article, that will have to wait until sometime this week or maybe next week as I might be headed up to Whistler for work. So what am I left with? I think there are some lessons to be learned from Seattle’s sports franchises and their food and beverage services. The one thing the 2 cities have in common is ridiculously over priced alcoholic beverages, with draft beer at Qwest Field in Seattle emptying your pocket at a rate of $8.50 a piece. The difference being that Americans have a wonderful thing called the Tailgate. I was lucky enough to be with someone who knew a Tailgater and we were graciously invited to join their party even though they didn’t know us and we weren’t from Seattle. They offered us beer and pulled pork sandwiches, gave us a place to park for free and when we all left to go inside the stadium they made sure they said goodbye and said it was nice to meet us. To say I was surprised by this generosity isn’t right, but I certainly didn’t expect it. In my opinion this is less about what Canadians think about Americans and more to do with what Canadians think of themselves. Tailgating would never work in Vancouver because there would be fights and vandalism and the city would never allow an event on city property without controlling with security and or ticket sales. In Seattle the tailgater’s converge on a place called Tailgate alley arriving as early as 7am to get a good spot, it is about a block from Safeco Field and 2-3 blocks from Qwest Field. The crowd taunts fans of the opposing team but it all feels very good natured and never feels uneasy like it might escalate into something less desirable. Canada’s view of our neighbors to the south could use a modern awakening as I fear we see them through a filter given to us by television and our own preconceived notions that we are somehow more polite and dare I say, better than them. This is simply not true. That’s enough of my rant for now except to say that I personally love America and Americans, except for Anderson Cooper. The food at Qwest field is pretty good, with lots to choose from. You can have anything from Popcorn, soft pretzels, hot dogs and hamburgers to pizza, Mexican food, Southern BBQ, fish and chips and the world famous garlic fries. 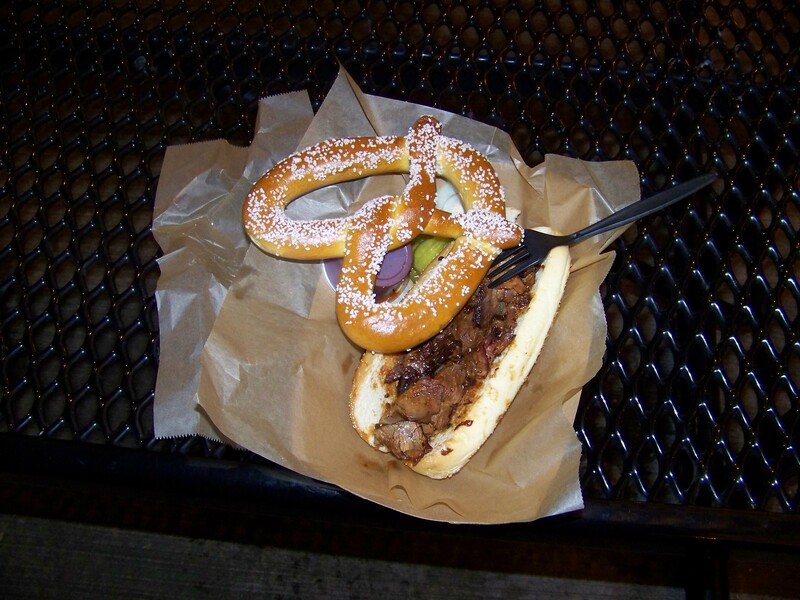 I chose to try the BBQ, specifically the beef sandwich with spicy BBQ sauce and a soft pretzel on the side. The sandwich was good but as is the case with most things at a major sporting event it was over priced. Sliced beef on a bun with sauce on the side for $9, a little steep. The pretzel was a little too salty for me but dipping it in the sauce of the sandwich made it easier to eat. 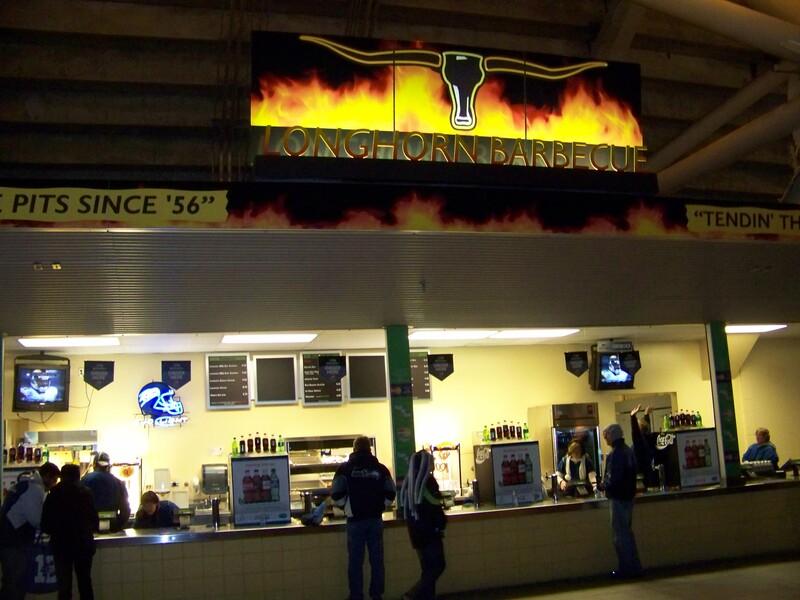 I hope that when the renovations at BC Place are complete that the food lives up to the new look of the stadium. 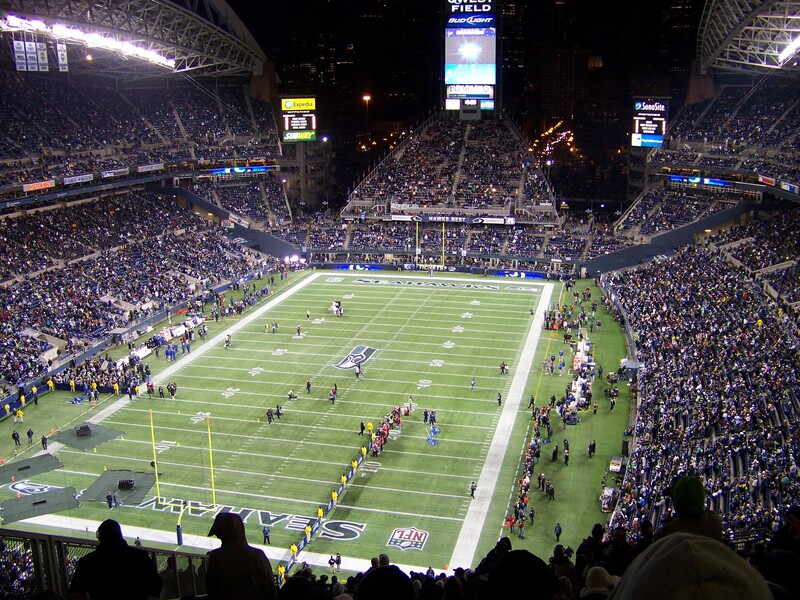 Qwest Field is an amazing facility with great sight lines, amazing views of the downtown Seattle skyline and it is filled with great fans who cheer for their team louder than any other fans I have ever met. Thank you Seattle for a great day and for restoring my faith in America and her people. America, land of the free, home of the brave and the capital of the pig out world. No where else is quantity of as much importance as it is to our southern neighbors. Luckily at Bob’s Burgers and Brew quality is just as important as the amount of food on your plate. Located throughout Washington State, Bob’s has been in business since 1982. During a recent trip to Seattle with Mr. What’s for Lunch BC Senior, aka my dad, we stopped at the outlet mall in Marysville for a little bargain hunting and some lunch. The outlet mall was a bust as I am a shopper who needs an item or items in mind prior to shopping but that left us more time for lunch before having to leave for Qwest Field. Located at 8822 Quilceda Parkway in Marysville/Tulalip just south of the outlet mall and the Tulalip Resort Casino, there is little else to choose from other than fast food, food courts or The Olive Garden (which I am not a fan of) in the area. It was pretty busy for a Sunday but it was lunch time and there was football on. The host told us that there was a 15-20 minute wait but we were free to grab a table in the bar if there was one available, which there was. On the menu I noticed they had one of my favorite American beers on tap, Black Butte Porter from Deschutes Brewery in Bend, Oregon. Black Butte Porter is what a porter should be and I drink it when ever possible. Seeing as the restaurant is called “Burgers and Brews” and I had already ordered my brew I decided on a burger, the Double Dutch Burger. According to the menu this is an old Lynden favorite, I’m guessing because of Lynden’s Dutch heritage? The burger is a 6 once charbroiled patty topped with American cheese, lettuce, tomato, pickles, “savory sauce” (Mayonnaise?) and a foot long hot dog cut to curl into a ring when it is grilled. 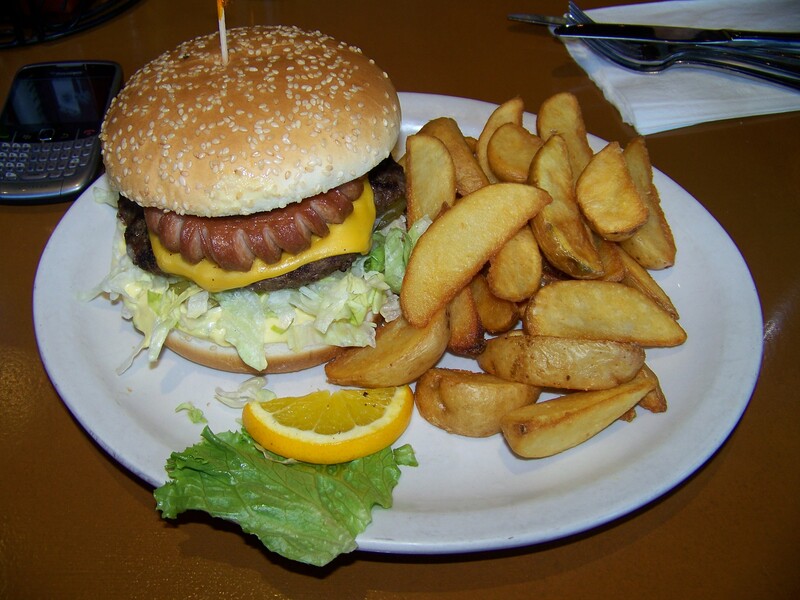 The burger was great, with the hot dog adding a nice flavor and texture similar to bacon but much more substantial. The Burger patty was nicely seasoned and not too salty with the texture of quality ground beef. The side I chose was Jo Jo’s, which in Canadian are called potato wedges. They were also very tasty, not overly salted and not dry like most potato wedges I’ve had. This place is a must for bargain shoppers/problem gamblers who like burgers and beer. The prices were very reasonable with my burger coming in at under $10, lots of food for not a lot of money, an American tradition. Story number 1 from my cross border adventure complete, stay tuned for story number 2 coming soon. While you’re killing time on the old internet you can check out my new online business card with photo courtesy of my pal Erika aka Eye Candy Photoworks. Is there anywhere I won’t eat and write about? No, definitely not as proven by this review. 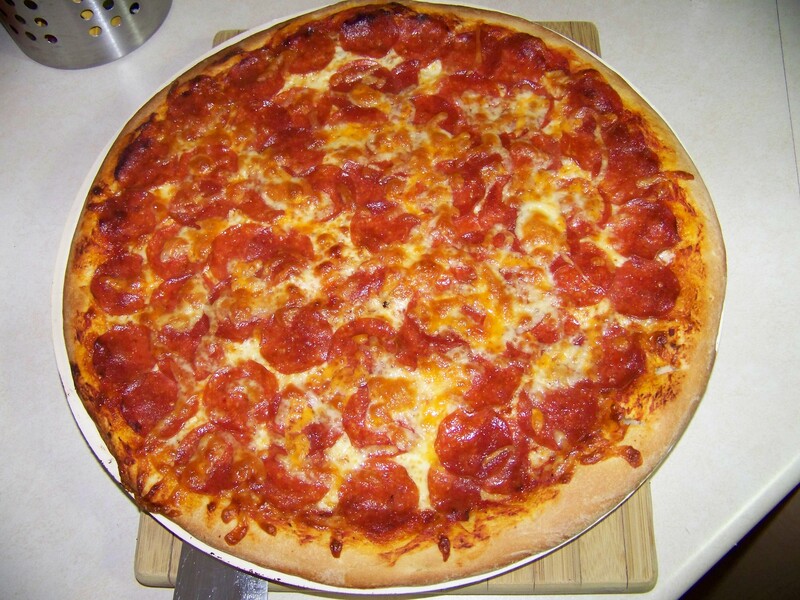 Papa Murphy’s is an American pizza chain which makes fresh pizza’s and sells them uncooked for you to take home and prepare yourself. 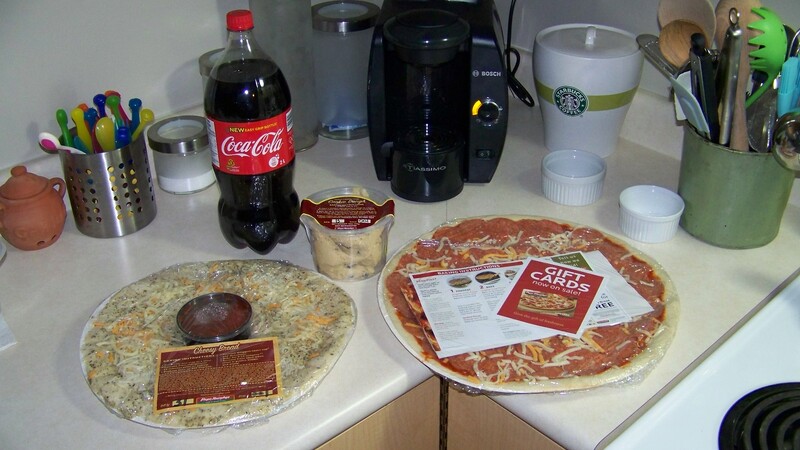 Founded in 1981 in Hillsboro, Oregon Papa Murphy’s is now based out of Vancouver, Washington with over 1150 stores in 35 states and 14 stores in Canada. I am no stranger to the Surrey Location at Fraser Highway and 188th Street as it’s right in between my home base and the In-Laws house making it an easy dinner solution for those days when you just don’t want to make something yourself. For just under $18 I came home with a large pepperoni pizza, cheesy bread with dipping sauce, a bottle of coke and a small tub of cookie dough to make dessert. All of the pizzas come on a special paper tray designed to cook to the pizza on but be warned, it’s a little hard to safely remove the pizza from the oven on these flimsy paper trays. 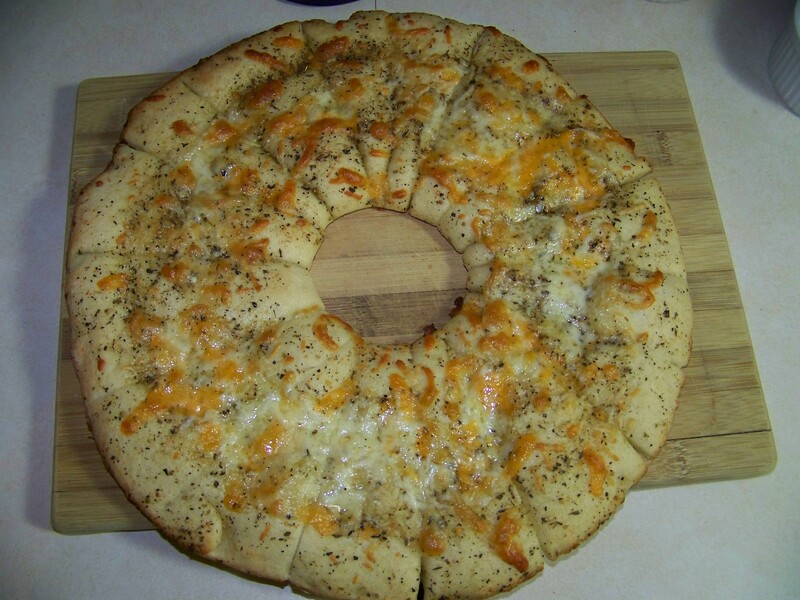 The Cheesy bread is a pizza crust with Cheese and some seasoning on it and comes with marinara dipping sauce. It is much better than most other cheese bread/bread sticks you get from other chain and cooking it at home means it’s very fresh. The pizza is really quite good as far as chain pizza joints go. It would be impossible to get the quality of somewhere like Royal Oak Pizza in this multi store, mass-produced format but they come surprisingly close. The crust rises nicely as long as you keep a watchful eye on air bubbles and pop them with a knife as soon as they appear. The sauce is not too salty as is the case from most large chains and the pepperoni and cheese seem to be of decent quality. The cookies are your typical pre-made dough type and are exactly what I expected. The only problem I had was making the dough balls the right size as most of them ended up square shaped from running into each other on the cookie sheet. Over all this is the best Large chain pizza around and has the added gimmick of “Take and Bake”. Papa Murphy’s is Zagat Rated and has won Best pizza Chain in America every year since 2003 from Restaurants & Institutions magazine, which folded in 2010 so I would assume the streak is over.